View all the AT&T plans that work with the Samsung Galaxy Go Prime. Compare AT&T plans that are compatible with the Samsung Galaxy Go Prime using our tool below. 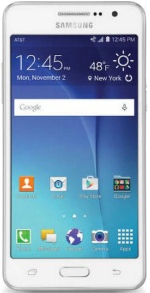 Samsung Galaxy Go Prime is an Android 5.1 Lollipop smartphone with a 5-inch QHD display and 960x540 resolution. It is equipped with a 1.2GHz Quad-Core processor and 1.5GB of RAM. There is an onboard storage of 8GB plus a microSD card slot for up to 64GB memory expansion. For photos, the device has an 8MP rear-facing camera with 1080p video recording and a 5MP camera in front. The 26000 mAh Li-Ion removable battery has the ability to last up to 18 hours of talk time and 14 days in standby mode.